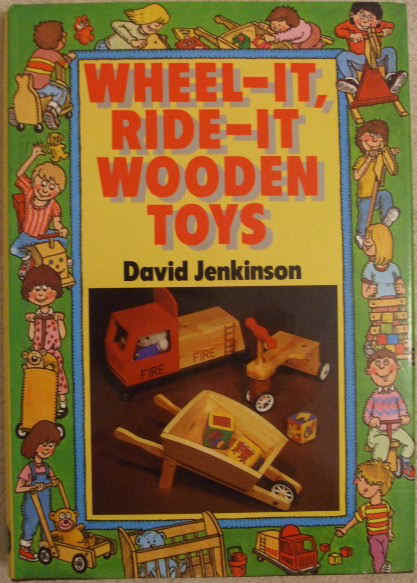 First UK edition, first print hardback of WHEEL IT RIDE IT WOODEN TOYS, by David Jenkinson and published by David & Charles PLC, London, in 1988. The book itself is in very good condition in large format (Brown boards with gold lettering to the spine) with only minor wear the the pictorial dust jacket which is not price clipped (minor creasing to the edges). Internally, the pages are clean and tight and there are no tears and no inscriptions. There is minor yellowing to the pages towards the edges. "A delightfully original collection of easy-to-make wooden toys to ride or push along. Sturdily made and brightly finished in varnish and paint, they look ambitious yet are straightforward to make at home with basic tools and easily purchased materials. Suitable for indoor and outdoor play, they have been tested for strength, safety, durability and - not least - popularity with the kids. Step-by-step instructions and many detailed drawings ensure that the construction stages are easy to follow, and the author has included a section on handy hints in which he passes on his many years' experience. All children love toys that move, that can be pushed or ridden; the selection in the book includes a dog, fire engine, tortoise, shopping basket, wheelbarrow and hobby horse. They will provide hours and hours of energetic play, will not cost a fortune, and parents can experience the added pleasure and pride in making unique personalised playthings for their kids." 120 pages. Profusely illustrated throughout with full page photographs and black & white line drawings, diagrams.